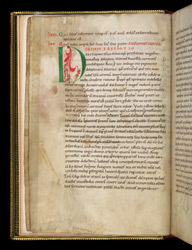 The most modern author in this volume is Lanfranc, archbishop of Canterbury, who died in 1089; this manuscript was written within a few decades of his death. It is not known where it was written (the styles of script and decoration combine Norman and English features), but by the 13th century the book was certainly owned by Abingdon Abbey in Oxfordshire. The first work in the volume is preceded by a list of chapters, the last two of which are at the top of this page. Then follows a preface, with a decorated initial 'D'. The first words of the text here ('Dilectissimo filio &') also appear in the author portrait at the beginning of the volume.